1. Should I go to the doctor after my car accident if I'm only "a little sore?" Certain injuries may not manifest themselves until sometime after a car accident. By not seeing a doctor, you risk delaying your treatment and further injury. Even minor soreness can be an indication of a more significant injury. If you believe that you may have been injured you should see a doctor. It is not uncommon for insurance companies to argue that the failure of an individual to see a doctor right away indicates that an injury diagnosed later must have resulted from an unrelated event after the car accident. 2. What am I entitled to be compensated for if the other driver was at fault? Generally speaking, if you are involved in a car accident that was the fault of another, you may be entitled to reimbursement for your medical and pharmacy bills associated with treatment for injuries sustained during the accident, cost of future medical treatment, lost wages, pain and suffering, property damage, and reasonable automobile rental charges incurred as a result of the car accident. You may also recover other costs directly attributable to the accident such as towing, storage, etc. 3. May I have my health insurance pay for my medical treatment? Yes. Your rights to recover damages incurred in a car accident that was the fault of another is not affected by any payments made by your health insurance. Depending upon the terms of your health insurance plan, the payments made by your insurance company may, however, be subject to reimbursement in the event of a recovery by you against the party at fault. 4. What if the faulty driver of the accident had no insurance? As a practical matter, you can only recover from a car accident if the faulty party has available assets or insurance. In some instances, a faulty driver who does not carry his or her own insurance may nonetheless be covered by another person's insurance policy. Additionally, if the faulty driver was acting during the scope of his employment at the time of the car accident, he or she may be covered by his or her employer's insurance. If your own insurance policy provides you with "uninsured motorist coverage," you may be compensated by your own insurance company if the faulty driver has no insurance. Given the complexity and nuances of these various insurance coverage issues, it is advisable to seek the assistance of our Phoenix, Arizona car accident lawyers to determine the existence of insurance or other assets that may be available to satisfy your claim. 5. What if the faulty driver has inadequate insurance to cover all my damages in the car accident? If the faulty driver does not have insurance coverage to the extent of your damages, you may be able to recover under your own insurance policy if it provides you with "under-insured motorist coverage." You should have our Phoenix car accident lawyers review your insurance policy to determine whether or not this coverage is available to you. You should not settle with the faulty driver's insurance company prior to reviewing your policy regarding car accident coverage with our lawyers, as it may affect your insurance company's responsibility. 6. When should I settle my car accident case? You should not settle your claim until after you have concluded medical treatment and have been released by your doctor. Otherwise, you may settle your case without knowing the full extent of your injuries and the treatment that will be required as to such injuries, leaving you responsible for any medical bills in excess of your settlement. At the same time, you must be mindful of the applicable statute of limitations period. You should seek the assistance of our Phoenix and Tucson area car accident lawyers to determine the applicable statute of limitations period and other deadlines, which may affect your claims, as these issues are fact-sensitive, and can vary from case to case. 7. Should I give a statement to the faulty driver's insurance company? You should be cautious in giving any statement to anyone concerning the car accident. Statements taken on behalf of the other driver by his or her insurance company are taken to protect the legal rights of the other driver. These statements may be misconstrued or used against you later. Accordingly, you should consult our Phoenix car accident lawyers prior to giving any statement to the faulty driver's insurance company. 8. Should I give the faulty driver's insurance company a medical authorization? If you provide the other driver's insurance company with a blanket medical authorization, you may provide them with the ability to obtain any and all of your medical records whether related to the car accident or not. Information gathered from these unrelated medical records may be used against you in negotiating a settlement of your case. Because medical information is privileged and confidential, you should consult with our Phoenix and Arizona car accident lawyers prior to providing the other driver's insurance company with a medical authorization. 9. Should I accept a check from the faulty driver or the faulty driver's insurance company? The acceptance of a check may be construed as a settlement barring any further recovery against the faulty driver or his or her insurance company. You should not accept a check or sign a release from the faulty driver or his or her insurance company until after you have completed medical treatment and have been released by a doctor. Otherwise, you risk settling your case for an amount that is insufficient to cover your medical bills and other damages. Insurance adjusters are trained professionals well versed in the art of settling claims for the lowest possible value. They employ a variety of techniques to convince claimants that they are better off settling their cases themselves than by hiring a lawyer. You should consult with one of our Phoenix car accident lawyers prior to accepting any payment, signing any release, or otherwise settling your claim to insure that you are receiving fair compensation and to insure that you are not jeopardizing your right to a full and fair recovery. 10. What photographs and other documentation will be helpful to my attorney in pursuing my Arizona car accident claim? Photographs of injuries, bruises, etc. can help our Phoenix and Arizona car accident lawyers substantiate damages related to medical treatment and pain and suffering. Photographs of vehicle damage and other property damage can help demonstrate the force of the impact and the extent of the property damage. Finally, photographs of the accident scene, including skid marks, can help establish who was at fault. Obviously, the timing of these photographs is critical. As wounds heal, they do not appear as serious. Therefore, photographs should be taken early on and at each stage of the healing process. Other helpful documentation includes: medical records, medical bills, prescription records, and lost wage information. 11. Why should I retain Phillips Law Group for my Arizona automobile accident? 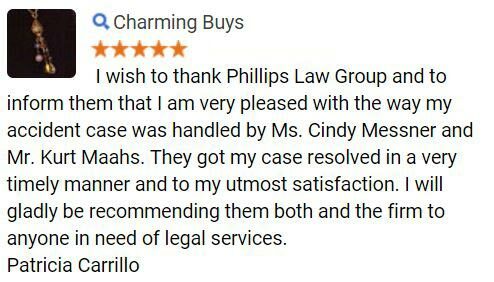 Phillips Law Group is one of Arizona's largest consumer law firms. 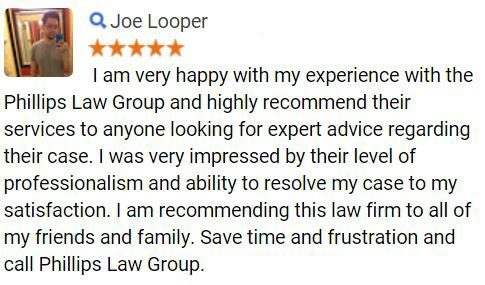 We have the experience and the resources to handle your case properly. We handle all types of negligence claims, including car accidents, and are comfortable working on medical malpractice cases. If you have been injured in a car accident, our Phoenix lawyers want to help you receive the compensation you may be entitled to under the law. Contact us to discuss your case at no cost to you. This section will answer common questions about your rights after a car accident, and what you can expect from the insurance company. If you have been involved in a car accident, the first step is to report the claim to the insurance company of the driver who caused the accident. The insurance company will handle the claim differently depending on whether your car can be repaired or must be replaced. 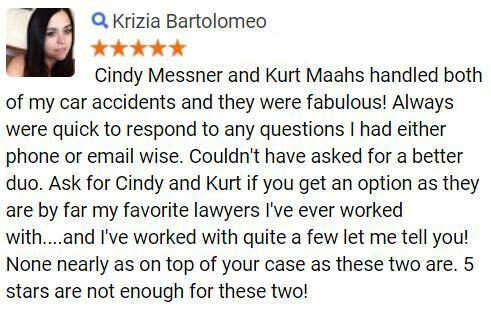 If at anytime you feel the insurance company is not treating you fairly, our Phoenix and Tucson area car accident lawyers can help you. Contact us. 1. Who pays for the rental while my car is being repaired? The insurance company for the person who caused the car accident is required to provide you with a rental car. If you caused the car accident, or there is not another person to blame, you must look to your insurance policy to determine if rental coverage is available. Many insurance contracts do not provide rental coverage for their own customers. 2. Do I have to purchase any extra insurance on the rental car? The insurance company will not pay for extra insurance if you purchase it from the car rental company. Your own insurance carrier should cover you while driving the rental car. Call your insurance agent to be sure you are covered while driving the rental car. 3. Who can drive the rental car? Normally, the rental car agreement only covers one driver. You will have to pay extra charges for having family members drive the rental car while your car is being repaired. 4. Where should I rent a car? Insurance companies often receive a discount with car rental companies. Ask the insurance adjuster handling your car accident claim where you should obtain a rental car. The insurance company has to pay the cost for the "reasonable incurred rental cost of a substitute vehicle." Clearing the rental car company with the adjuster will avoid the possibility of paying extra for your rental car. Sometimes, you must pay the rental car bill first, with reimbursement coming from the insurance company later. If you feel an insurance company is not fulfilling its rental car obligations, contact our Phoenix car accident lawyers for help. 1. Can I demand that my car be repaired? Normally, the insurance company has the sole option to either repair or replace your vehicle after a car accident. It is usually a question of cost efficiency. That is, if it costs less to replace your vehicle than to repair it, the insurance company will declare your vehicle a "total loss," and take action to replace your vehicle. 2. Can I choose my own repair shop? In the event the insurance company chooses to repair the vehicle after a car accident, you have the absolute right to decide who will repair your vehicle. Many insurance companies will evaluate the cost of repairing your vehicle separately and independently from any repair shop. The insurance company will then work with the repair shop of your choice to get your vehicle repaired. 3. How do I prove what damage was caused by the car accident? Sometimes, the insurance company will claim that some damage to your vehicle existed before the car accident. Similarly, accidents often generate mechanical malfunctions. It can be difficult to determine if a mechanical problem was caused by the wreck or by normal wear and tear. Therefore, it is important that you prove the connection between the car accident and the damage you are claiming. Ordinarily, mechanics and body repair persons can help you determine the age of body damage or the cause of a mechanical failure. They can help you convince the insurance company that the car accident caused the damage. 4. Can I demand original manufacturer parts? The insurance company must return your car to the condition it was in before the car accident. Because your car was probably not new, the mechanic may use refurbished or reconditioned parts. However, you have the right to demand original manufacturer parts so that, if your car is a Ford, you should receive genuine Ford parts. Contact our Phoenix car accident lawyers if an insurance company is not repairing your vehicle to your satisfaction after an accident. What If My Car Is Declared a Total Loss? 1. What is a total loss? A "total loss" is when it costs more to repair than replace your vehicle after a car accident. If your car is declared a "total loss," the insurance company buys your car for its market value. A rental car must be provided until the adjuster makes a reasonable offer. The difficulty is determining market value. Sometimes it takes a week or two before an offer is made, so remain patient. The insurance company has 30 days to process your claim. 2. Who pays for towing and storage costs? Normally, the insurance company for the driver who caused the car accident will pay the reasonable towing and storage costs of your vehicle. They will continue to pay the storage costs while determining whether your car is a "total loss." If the insurance company declares the car a "total loss," they will move the car from the repair shop to a wrecking yard or a free storage area. You will be called before your car is moved. If you refuse to allow the insurance company to move your car, you will have to pay the storage costs from the day of your refusal forward. If you want to keep the vehicle, you can pay to have it towed to your home. 3. How is the value of my car determined? If your vehicle is declared a total loss after a car accident, you are entitled to the "fair market value" or the "actual cash value" of your vehicle. Insurance companies usually determine fair market value by referring to the "Blue Book" or a similar publication. Generally, the insurance company is trying to determine what your car was worth immediately before the accident. Once they make an offer, it is up to you to either accept their offer, or show them why your car is worth more money. If you think your car is worth more than the amount offered, check with the newspaper or the Auto Trader for the sale price of cars the same make and model as yours. Cut out the ads and send them to the insurance adjuster. You are "upside down" on the loan for your car when you owe more money than its fair market value. There are many reasons why people are "upside down" on the loans for their car. Sometimes they are "upside down" because they purchased an extended warranty. Ordinarily, an extended warranty can be canceled, and you are entitled to part of the money you paid for the warranty. For example, if you purchase a five-year warranty and your vehicle is declared a total loss after a car accident in the second year, you are entitled to a refund of 3/5th of the purchase price of the warranty. Unfortunately, the adjuster will not pay more money to you simply because you are "upside down" with your car loan. They are only obligated to pay the "fair market value" of your car. 4. Can I recover for recent repairs to my car? When an older car is involved in a car accident, it is hard to recover the cost of recent repairs. New tires or a new engine only slightly increases the value of a vehicle. If you have receipts for the new motor or transmission, show them to the adjuster. Simply giving the adjuster the receipts may prompt a better offer. 5. The insurance company told me I could keep my car if I pay the "salvage value." What is "salvage value?" Salvage value is the estimated value of the vehicle damaged in the car accident. If you wish to keep the wrecked car, you may purchase it back from the insurance company for its salvage value. The adjuster can deduct the salvage value from the settlement and you can keep the car. 6. Are there any other damages for which I can expect the adjuster to pay? The prorated amount of your yearly car tax and registration fees. 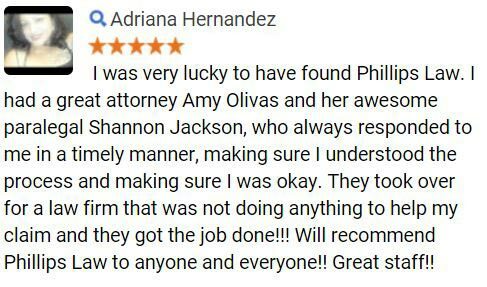 Contact our injury lawyers at the law firm of Phillips Law Group if you feel at any time that the insurance company is treating you unfairly. We will help you receive the compensation you may be entitled to after a car accident.